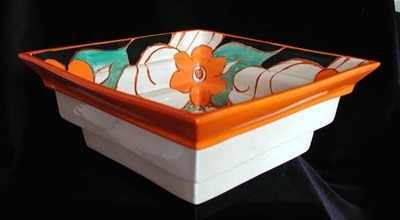 Square stepped bowl in the Floreat pattern. The bowl has four steps (the bottom one is painted black). Shape 367. No chips or hairlines. Slight repainting to the green leaves on the inside. Size 9 inches wide and almost 5 inches high. Signed "Bizarre by Clarice Cliff".